When it comes to setting up a conference, whether it's for a product launch or just simply a conference for your company we can take care of every aspect for you ensuring that your target audience is dealt with professionally and efficiently throughout the event. We will also ensure that we select the most suitable venue for your type of conference to suit your budget, accommodation requirements and number of attendees. The right speaker at your conference can provide your audience with a pleasurable break from the business side of the event. They can be interesting and inspirational bringing their personal knowledge to your audience in a charming and charismatic manner. 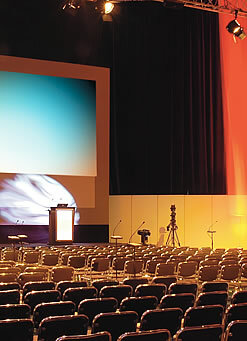 For your conference to achieve its potential it is essential that the production side is carefully planned, covering all areas from technical requirements to the logistic side of things. This will guarantee your conference to be a resounding success. Lighting is an important factor in bringing style, sparkle and elegance to any event regardless of its style. From the very first sketch on a piece of paper and throughout the planning process to the very last switch being turned on the end result will be amazing. We can provide an extensive range of audio visual equipment for your conferences and events, regardless how big or small they may be. For your conference or event you will more than likely require a set design to include your company's logo or graphics to make it truly one of a kind, we can help you achieve this with inventive and original ideas to design an eye-catching set built with the greatest of care. A film can be used in many different ways to enhance your event and really give it that extra touch. Whether it's a film that raises awareness for a charity, highlights your company's profile or even a film that simply serves as a memory for your special event we can offer you an inspiring production.